Do you mean, where were the Khajiit when the Dragon Broke? R'leyt tells you where: recording it ... While you were fighting wars with phantoms and giving birth to your own fathers, it was the Mane that watched the ja-Kha'jay, because the moons were the only constant, and you didn't have the sugar to see it. We'll give you credit: you broke Alkosh something fierce, and that's not easy ... You did it again with Big Walker, not once, but twice! Once at Rimmen, which we'll never learn to live with. The second time it was in Daggerfall, or was it Sentinel, or was it Wayrest, or was it in all three places at once? Get me, Cyrodiil? When will you wake up and realize what really happened to the Dwarves? — Where Were You When the Dragon Broke? A Dragon Break is a phenomenon where linear time is broken, and becomes non-linear. The "Dragon" refers to Akatosh, the Dragon God of Time. A Dragon Break not only precedes significant changes in Tamriel, but challenges mortal comprehension. It is a re-alignment of time and space in response to an event which makes the normal continuity of reality impossible. The chaos which ensues is a refrain of the chaos of the Dawn Era. The area that is noticeably affected, and length of the interval measured in the areas not apparently affected, varies with each Dragon Break. Historically, the cause is often attributed to mortals manipulating divine matters. Possibly the first Dragon Break in known history was in Skyrim during the Merethic Era, and it served to bring about the end of the Dragon War. The ancient Nords confronted Alduin himself, the First-Born of Akatosh and leader of the dragons. With no conventional means to defeat the wyrm, their ancient champions instead used an Elder Scroll and the power of the thu'um to create a "Tid-Ahraan", or Time-Wound, and thereby eject Alduin from their time, propelling him into the future. His temporary defeat cleared the way for Nordic civilization to emerge as it is known today. This distortion of time and space had some similarities to other Dragon Breaks, though it has not been explicitly described as one. A sect of the Alessian Order, the Maruhkati Selective, is said to have caused the longest known Dragon Break, known as the Middle Dawn (or colloquially as "the" Dragon Break), which is thought to have spanned one thousand and eight years from the 13th to the 23rd centuries in the First Era,[UOL 1] by attempting to exorcise elements of Elven Auriel from Imperial Akatosh. This is the only Dragon Break that is a universally-known event, though some civilizations claim to have been protected from it. Mnemoli the Blue Star, a Magna Ge associated with un-time events, grew bright enough during this Dragon Break to be seen in the daytime sky. Yet in later eras, the occurrence of this event became disputed, most notably by the scholar Fal Droon. He posited that no cosmic disruption took place at all, and that the "Dragon Break" story was concocted in the early Third Era to explain inconsistencies in the Encyclopedia Tamrielica. He cites "scholarly inertia", obsession with "eschatology" and fanatical "Numidiumism" in order to explain the perpetuation of the error. Fal Droon's claim that the Dragon Break was a Third Era fabrication is apparently discredited by older sources, which are known to have described the Dragon Break as early as 2E 582. In particular, Vindication for the Dragon Break seems to describe the Maruhkati Selective's justification for the Middle Dawn before the event itself. The Dunmer of the era were hostile towards the Empire, yet they still acknowledge a Dragon Break occurred. Furthermore, a member of the Elder Council claimed that the oversoul of emperors within the Amulet of Kings confirmed that a Dragon Break took place. The Council purportedly gathered information from every province, information which never coincided except by mentioning that all the folk of the continent tracked the fall of eight stars, which they used to count their days. The first activation of Numidium by Tiber Septim at the town of Rimmen in Elsweyr is said to have preceded a Dragon Break that heralded the Third Empire. The second activation of Numidium in the Iliac Bay region during 3E 417 brought about another Dragon Break. Sentinel, Wayrest, Daggerfall, Orsinium, and the Empire all gained control of the Totem of Tiber Septim, somehow at the exact same time, which allowed them to control the power of the golem. When this "Warp in the West" ended (the effect objectively seemed to last roughly two days), the many other kingdoms of the Iliac Bay region were conquered. Each remaining kingdom consolidated its newfound territory and swore fealty to the Empire, bringing historically unusual harmony to northwestern Tamriel. Because the use of Numidium has not once, but twice been associated with a Dragon Break, it is speculated that some of the events surrounding the Battle of Red Mountain and the disappearance of the Dwemer around 1E 700 may also be explained by a Dragon Break. 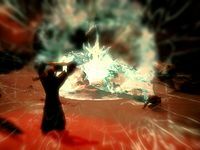 This purported Dragon Break, sometimes called the Red Moment,[UOL 2] involved the battle which ultimately resulted in the disappearance of the Dwemer. The accounts of this battle often conflict with each other on various points, such as the loyalties of the parties in the battle and the events which transpired at the climax of the battle, including how the Dwemer met their fate. A "kalpa" is thought to be the conventions governing the flow of time, and that the end of the Dawn Era and its chaos was the end of a previous kalpa. [UOL 4] Dragons Breaks could possibly be understood as interruptions in the new kalpa. Where Were You When The Dragon Broke? contains an account that is generally accepted as referring to the use of the Numidium by Tiber Septim, as well as the Warp in the West. This text also refers to Mannimarco as the "God of Worms", a title used only after the Warp allegedly allowed his apotheosis. Yet copies of the book were discovered in the Second Era, before the Warp occurred, and have the same text as those found in the Third and Fourth Eras. In The Dragon Break Re-Examined, the scholar Fal Droon attempted to debunk the Middle Dawn, and thus the "doctrine of the Dragon Break" in general. The book first appeared in TES III: Morrowind, which took place in 3E 427. Droon writes of the fall of the Septim Dynasty in the past tense, even though it would not occur for another six years, suggesting that Droon did not actually write the text until after the end of the Septim Dynasty and the Third Era. Thus, his book ironically seems to corroborate that Tamriel is susceptible to distortions in time such as the Dragon Break. ^ Paarthurnax's dialogue in Skyrim.